We are a family owned business with over 10 years doing business in South Florida. 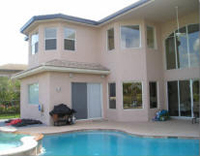 We are licensed and insured, Licensed and approved Contractor with My Safe Florida Home Retrofit Program. As required by State Law F.S Chapter 455.288, PBC Building Dept. and DBPR, it is unlawful to employ unlicensed contractors. Our best advice to you, the Homeowner, before making a commitment, is to verify the background of the company of your choice, their Licensing and Liability Insurance with your local County’s and/or Licensing Board as well as your City’s Building Dept.